mwe3.com: Its been way too long since the last Psychoteria album, The Hard And The Soft but I Think Ill Just Stay Home is your best album yet. I was happy to see your dog, (same dog?) on the cover, and is that your wife on the cover with you? It's been a while since we met back in 2003. What was the mission with the new album and how would you compare this new CD with the earlier Psychoteria albums? ERROL ANTZIS: That is, in fact, Baby, the same dog who graced my prior CD, but unfortunately she passed away shortly after the photos were taken. Ive dedicated the CD to her, as she was a true inspiration as well as my best friend. The woman in the photos is actually Juliana Hansen, one of my wifes acting students. While there was no mission, per se, with this CD, I wrote and recorded most of the songs during a very difficult time in my life, as evidenced by the majority of lyrics. It was very cathartic to compose the music and pen the lyrics while so many things were happening. That being said, while I feel very good about all three of my CDs. 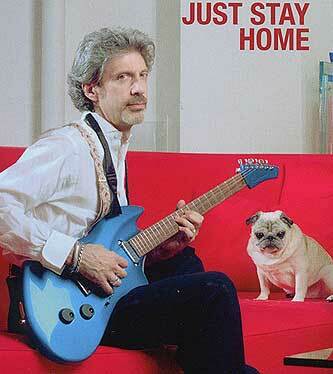 I Think Ill Just Stay Home is by far the best with respect to composition, orchestration and recording quality. mwe3: How do you balance your love of 60s pop with your ability to write a great rock instrumental? Can you say something about the instrumental trio on the albumthe first Acting Class (R&B) and then Acting Class (Pop) and then Acting Class (Rock), what I call the Acting Class trio. I know your wife is a beautiful actress! EA: Thanks for the compliments about my wifeIll pass them along! I try very hard to integrate all of the types of music that have served as influencesand they range from 60s pop, as you mention, to metal, prog and a smattering of country. The CD has a very diverse range of musical genres being represented, and I hope that people appreciate the fact that there can still be cohesiveness even with this broad range. The Acting Class trio of pieces were composed as a score for a TV pilot. The pilot was well-received but has yet to find a medium for further production. I truly enjoyed the process of scoring, though, and there was quite a bit of additional music I wrote for the pilot that was used as backing for various scenes. mwe3: I was amazed at the new tracks with Jan Akkerman. How did you hook up with Jan and get the tracks finished? I was also amazed at another instrumental here, The Soft And The Hard, which is a play on words regarding the title of your second solo album. EA: I was introduced to Jan through a friend of mine who owns an indie record label, and who handles many of Jans tours in Europe. Jan is one of the nicest, and of course most talented, artists Ive ever met. We worked via the internet, sending music files to each other, and Jan came up with very creative and complimentary parts for all of the songs I sent to him. Jan played on about half of the tracks on the CD, including Way Out, Acting Class (R&B), I Think Ill Just Stay Home, The Soft And The Hard, Anatomy and The Loner. Jan told me that he really enjoyed playing on my tracks, as many of them represented genres which he hadnt played in quite some timefor example The Loner which is a country-inspired song. The Soft And The Hard is, as you point out, a play on the title of my second CD, and the title is inspired by the dynamics in the song. It was a lot of fun to compose and play, because it has a great groove that is very inspirational for instrumental soloing. mwe3.com: What guitars do you feature on the album and what do you think of the current state of the guitar world these days? EA: Quite frankly, I believe I played over 20 guitars on the album, and likely more, many on the same songs, to sometimes create a dense wash of guitar sounds, but also to often provide distinct sounds as if they were actually different types of instruments, and not only electric and acoustic guitars. 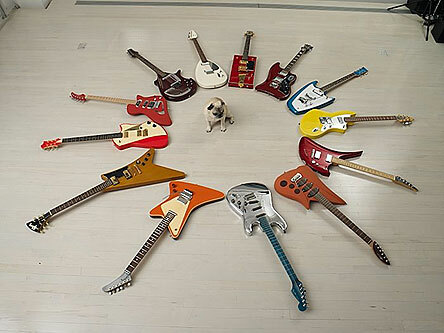 mwe3: Are you still in search of that elusive guitar and what was the last guitar you acquired or became fascinated with? 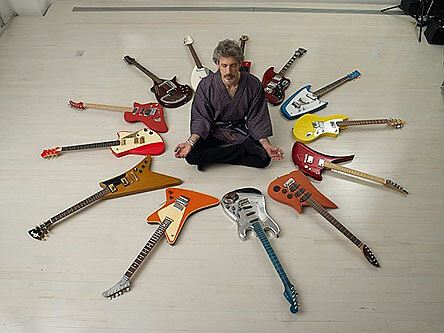 EA: I actually buy and sell guitars all the time, and with so many instruments at hand I have to say that there is no longer a single instrument for which Im still searching. My most recent purchases, after the CD was released, were a collection of Kawai Moonsaults. Very rare, not well known, but incredibly artful and playable. mwe3: Were you also playing drums and keyboards on the album? I saw Jonathan Mover played drums too and Greg Dibenedetto played guitar too. EA: I played both drums and keys on almost every song. Jonathan, who is one of my closest friends and an amazingly talented drummer, played on two songs on the CD, and his contributions were simply fantastic. Greg, who has been a friend since grade school, believe it or not, played some of the intro guitar on The Loner, along with Jan Akkerman and me. As I mentioned, I did a lot of layering of guitars to achieve the type of sound I was after. mwe3.com: The vocal cuts were great and you sound inspired. Can you say something about two of my favorite tracksthe title track I Think Ill Just Stay Home and the CD closing I Used To Be which has a kind of Lennon-esque edge to it. EA: I truly appreciate your compliments on the vocals, as that is an area that I only recently became comfortable with. I think the vocals really fit the songs, and I made sure that I only cut them when I was in the right mood for each song. I didnt try to just sing and then hope that the mood of the vocals matched the song. I Think Ill Just Stay Home is one of the lighter lyric-ed songs on the CD, and I tried to sing it with a bit of humor. I Used to Be is the complete opposite. Its a song about no longer having the drive or the spark to move forward, and coming to realize that things may never be the same. It was a tough song to sing, as the lyrics and the meaning were very emotional for me at the time. Luckily, the various situations that inspired those lyrics have improved, and Im not sure I could sing it the same way again. mwe3.com: The Beatles cover is brilliant. Your vocal kind of turns it into a Byrds sounding cover, more upbeat with an uptempo sound. What led you to Its Only Love? Sounds like it was waiting for your cover. What guitars did you combine on that track? EA: While I count Jan, Jimmy Page and Michael Schenker as major guitar influences, The Beatles were it for me. I had to honor them on the CD, as I like to think their song-smithing was also very influential for me. I never thought of the cover as sounding Byrds-like, but I can see the reference. I just thought of performing the song in a slightly more modern way, with somewhat heavier guitars and a slightly more forceful vocal. The song is one of my favorite Beatles tunes, but then again, most Beatles songs are my favorites. I believe I used a Jimmy Page Les Paul on that one, and used a recently acquired vintage Coral Sitar that had been owned by Frank Sinatras guitarist, Tony Mottola, for some of the backing parts. mwe3: Its always current to look back at that Rubber Soul late 65 period and how it kind of spawned the whole folk-rock thing. Are you still a big collector of rare music of The Beatles and what did you think about the Beatles In Mono box? Do you think there are any rarities left in the world and what is your favorite Beatles CD or Lp of all time? EA: I have a very, very large collection of Beatle recordings, but want to note that I never purchase pirated CDs, i.e. copies of commercially available music, as that is literally stealing from the artist. I do, though, collect a lot of studio rehearsals that were never made available commercially (until the Anthology series was released), as I find it fascinating to listen to the Beatles compositional process. Hearing a song with which youre completely familiar, but played in a different way, perhaps with different lyrics, structure or chords, is an amazing experience. I love the mono and stereo boxes that were recently released, and while I do have all of the original vinyl LPs, which by the way I still think sound more involving and warmer, its nice to have everything in such a convenient format. It is interesting to stay current with all of the rarities being released from the Beatles, or any other musical artists, and who knows how much more is still hidden away somewhere, awaiting the light of day? I really dont have a single favorite CD or LP of the Beatles. While I like some songs better than others, theyre interspersed throughout their catalog. mwe3: You can tell your CD sounds great, especially as it was superbly mastered by George Marino at Sterling. George mastered Double Fantasy with John and Yoko no doubt controlling every nuance. Did you sit in with George? How does mastering affect the sound of an album? EA: I knew that George had mastered many famous albums, but was unaware of that one in particular! I did, in fact, work directly with George during the entire mastering process, which took one full day. One of the highest compliments Ive received yet, was at the end of the session. George looked at me and said, You know, I really didnt have to do very much to this CD. mwe3: Can you say something about your other recent activities, work at the Drumhead magazine and other current interests or concerns and hobbies and other upcoming plans? EA: I am the type of person who has many, many interests, and all are related to music in some way. I started Drumhead with Jonathan Mover nearly five years ago, and at this point Jonathan handles virtually every aspect of the magazine, and does so incredibly well. I also have a day job, if you will, which is my full time occupation. Im a partner at an investment bank in NYC, and head the banks Digital Media and Entertainment group, which provides advisory services and raises capital for companies in music and other areas of internet-based entertainment. Its a great job, and certainly compliments my musical proclivities as well.